Summary: After years of following her navy officer husband on assignment around the world with their three children, Grace Bennett realizes that she's left something behind -- herself. Steve Bennett can't understand the unraveling of his wife's heart. He wants to set things right, but when a secret from his past is revealed just as he's sent out to sea, their already-strained relationship is pushed to the edge. Now, with plenty of space to ponder the true distance between them, Grace begins to reinvent herself. THE OCEAN BETWEEN US, I thought it had some potential. And then, I read Bermuda Onion's review, and she just loved it. I thought -- what the heck? I'll give it a chance! I actually really did enjoy THE OCEAN BETWEEN US. While I was expecting a romance book (not my favorite genre), I found this one to be more along the lines of women's fiction. It was the story of a wife and mother who was married to a career Navy man. The novel shows the ups and downs of their relationship, and how the Navy lifestyle has affected the entire family. One thing is for sure, this novel reminded me how grateful I am for families that dedicate their lives to serving our country so the rest of us can have our freedom! I live in a town which is home to a pretty big Navy base, so I've met quite a few Navy wives since I've lived here. I have always been in awe of Navy families and how they manage to do it all! I can't speak for everyone (and certainly not Navy families), but a lot of the characters in this story seemed to ring pretty true to me, especially Grace and her children. I know that I would share many of the same thoughts and feelings that Grace did (although I think I'm entirely too selfish to give up so much for my husband's career.) And maybe that's one of the reasons that I enjoyed this novel so much -- the characters seemed to be very real to me and I could relate to them. Since I am about Grace's age (although my kids are much younger), I understood so many of her feelings. As my kids get older and more independent, I look at myself and think what's next for me? I didn't love my career, but I did give it up to be a full-time stay-at-home mom because it was the right thing for our family. In so many ways, I related to Grace and her self-discovery because I too wonder what the next steps in my life will be. And to be entirely honest, if I had a husband who was away at sea for months at at time, I'm sure I'd begin to have some doubts about our relationship as well. Of course, the meat of the story was about Grace rediscovering herself, and in the process, evaluating her life and her marriage. However, I also liked how the author included some side -stories about the Grace and Steve's teenage children. My father wasn't in the military, but we did move around as much as some military families. I could really relate to how each of the kids handled moving all of the time and making new friends. I also appreciated how she showed how each child dealt with having an absentee father much of the time. I'm telling you -- these Navy families are truly a special group! While this book wasn't short (it was over 400 pages), I read it in just a few sittings. I did have a hard time with the first two chapters because they were written with so many military terms, (and I was hoping that it was a temporary thing! ), but once I got past them, I couldn't put this book down. Ms Wiggs' really drew me in with the characters and their feelings. Of course, she also introduced so much suspense and tension in the first few chapters that I couldn't wait to find out what happened. I think her process of storytelling -- introducing the action in the first few pages and then using flashbacks -- was an extremely effective way to keep the reader's attention. I was very impressed with her writing style, and I guess that's why she's written so many best-selling novels! 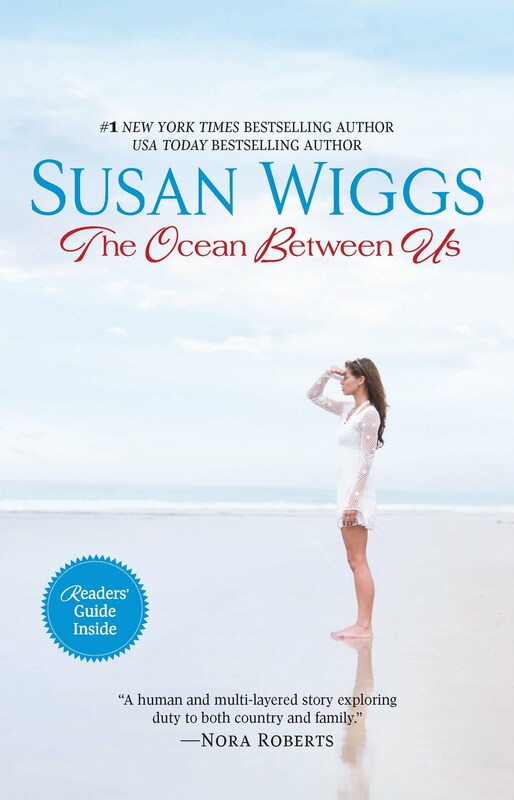 THE OCEAN BETWEEN US would make an interesting book club selection, especially for groups that have wives and mothers as members. There is a reading guide included in the back of the book, but it is also available here (just scroll down the page.) I really think this book has the potential to make for a very good meeting because there are so many real-life issues for today's women. Some of the topics that you might want to delve into include marriage, love, duty, obligation, sacrifice, parent-child relationships, and commitment. I am considering asking my group about this one especially since one of our members is an ex-Navy wife! I was pleasantly surprised by how much I enjoyed THE OCEAN BETWEEN US. I was expecting a romance, and it was a love story, but it ended up being so much more! Thanks to Big Honcho Media for providing me with a review copy of this book. Make sure you check out Ms. Wiggs' guest post about writing in different genres. Yeah, I'm not big into romances either, but this one feels different than that. Even if you're not a Navy family, I think alot of people would find common ground in this novel. Who doesn't have problems in their marriage, and who doesn't make sacrifices? I'm so glad you liked this one - it just struck a chord with me and I couldn't put it down once I started it. I read her previous book and felt the same way - I expected a romance and was pleasantly surprised! I may have to keep this one in mind for the summer. I avoided the book because I thought it was going to be a romance. So glad to know that it is a deeper read.